When developing a custom battery pack, the last thing anyone wants is to hear their development hit a snag. Batteries already have a lengthy timeline going from concept to production, so staying on schedule is incredibly important. Of course, sometimes delays can just happen for reasons you have no control over, making it even more necessary to nail down the areas you can influence. Factors such as knowledge of certification requirements, manufacturing support capabilities, and prototyping processes can help keep your development on the right track. One of the first things that needs to be understood is the level of certification the battery pack will need in order to support the markets intended for your device. Battery designers and assemblers are familiar with what regulations are required by law. However, the customer’s marketing and research team should determine what additional certifications are needed for the battery or device based on the intended markets you will be selling to. Knowing which certifications will be required are key for including within the battery design appropriate safety features that meet specific criteria for UL, as well as specific medical class levels. It is equally important to do research when selecting a battery cell manufacturer. Support can change from one manufacturer to the next, so knowing how well each facet of your development is supported is crucial. A lot of manufacturers will not support class 3 medical. Certain cell manufactures have models that, once they’re not in high demand, will face an end of life to be discontinued. In addition, support could cease after all the investment in the development and certification has been completed. Some customers have opted to perform dual certifications on their battery using dual cell manufacturers. They are targeting cell models that are similar in performance characteristics that can utilize the same electrical design, programming, and calibrating. This approach will cost more upfront on the development and certification but has advantages long term. Imagine if one of the cell manufacturers elects to discontinue supporting that specific business market or the cell model becomes obsolete due to lack of demand. The prototype process is also something that is typically factored in to only have one iteration. But depending on how sophisticated the battery electronics need to be, it is likely going to take a few versions with revisions to achieve the end results required. Designing electronics for a new battery is an educated plan but all best laid plans need to be tested to validate and confirm the design will function as intended. More times than not, there will be changes or modifications required during the functional testing of the battery. Even if the battery electronics test and function as intended at the first build, the battery still needs to be installed into the customer's device for system level testing which may uncover functions or parameters that need altering or component adjustments. The sample process may take a few changes in the schematic, additional PCBAs built, and more levels of testing to include new battery samples produced and tested before the design is locked in and ready to move to the next phase. It is critical to lock in the design before moving to the next phase in the development, especially if it is a lithium battery as the next phase would be the regulatory testing for the DOT UN38.3 (Department of Transportation / United Nations) certification. The DOT UN38.3 certification must be completed to validate the design has been tested and safe for transportation before it can be submitted for any further regulatory testing. Once the DOT UN38.3 certification has been completed, there cannot be any changes to the design or the certification will no longer be valid. Another development factor to consider is selecting the design firm to develop the battery enclosure. Keep in mind, if the design firm is not experienced specifically with battery packs, they may not understand the internal construction requirements of the housing which includes placement of ribs, cell cradles, designing in spacing for wiring, impact points, and other relevant criteria. The battery enclosure is a key part of the design for manufacturability at the assembly level, as well as to be able to pass drop test requirements that are governed by UL. Even with the best collaboration efforts between the battery designer and a potential firm that is inexperienced with batteries, there will most likely be many reviews and design changes that will ultimately delay the development. The injection molding can be another lengthy process depending on how complex the enclosure design is and how many elements there are to the plastic. Battery designs with higher cell counts require more than just a top and bottom. 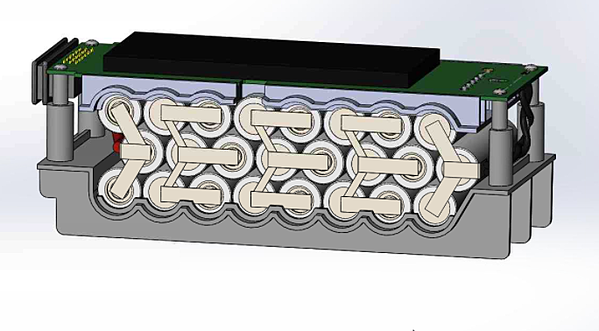 Often spacers are added to aid in thermal aspects to keep the cells at a consistent temperature across the configurations as well as adding cradles to support the multiple rows of cells. Custom latch mechanisms are typically used to interlock with charging bays, custom gaskets, etc. Mezzanines are added to accommodate multiple control and connector PCBAs and custom venting to aid in cooling during charging. These types of features will require multiple injection molded parts to create this type of enclosure. Depending on which suppliers you select, this can add weeks to the development cycle. While 3D printed parts can be used for prototyping and some of the initial regulatory certifications, the injection molded parts that will be used for the production are required to submit for certifications like UL and IEC. As battery pack designs become more and more sophisticated, the end result is a more intensive design requiring a longer development time. Knowing your certifications helps to understand what features need to be designed in, as well as what regulatory timelines will be required to certify. Factoring in prototype tweaks and planning for some re-iterations will be a more realistic approach when forecasting your product launch. Choosing a qualified and experienced custom battery manufacturer when developing your enclosure gives you peace of mind knowing more advanced capabilities can be achieved.